Round four of the F1 series has been run. As there have been plenty of pics of the cars racing previously I have decided to put pics of the two support races instead only. A varied field in Pre 1972 Sports. No 1 was the no 9 GT40 of Joe. 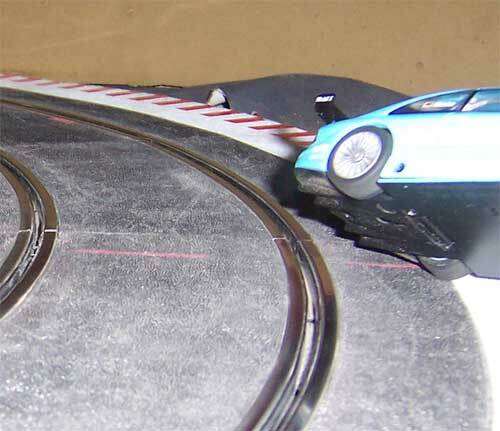 The car is highly modified underneath to allow full tilting and is a credit to Joe's skill at setting up a car as the Scalextric GT40's are very difficult to get going quickly with no magnet. Jamies red Corvette also went very well and pushed Joe to the wire. Bo's white Vette also was quick and this has proven that front engined cars are just as fast with strategically placed weight. 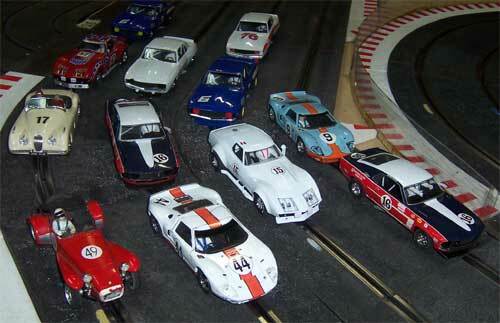 Als' super seven was also very fast as was Greg's Ninco Jag classic which kept my Mustang and others honest. Open sedans were next up and NC5 engined Ninco Mercedes and Audi's were the car to have although Jamie's Pro Slot Alfa with gold motor was fast but appeared a bit difficult at the limit probably due to its light weight. 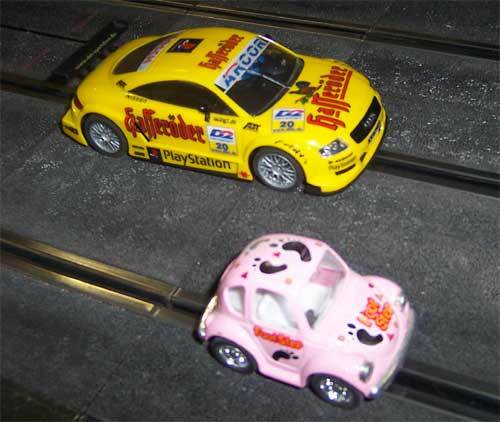 I had my first win with the Ninco Mika Mercedes CLK DTM. Devious Dave was not too far behind with the Fly BMW with Jamie's Alfa next. I bought along Team Mclaren for the night but only the proven winner Mika Hakkinen could come through on the night. 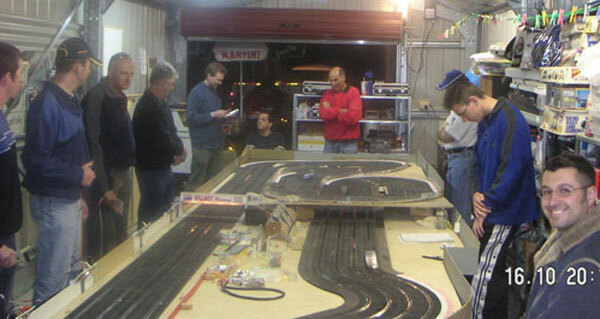 Devous Dave in the Scalextric GT40 hunting down Rolands Camaro. Roland put up a great first showing turning up at the start of the third heat which he was in borrowing a Lotus Super Seven two minutes practice and picking up a third by not crashing on a track he had never driven. He then wacked some lead in his Camaro and finished off the races with that car. 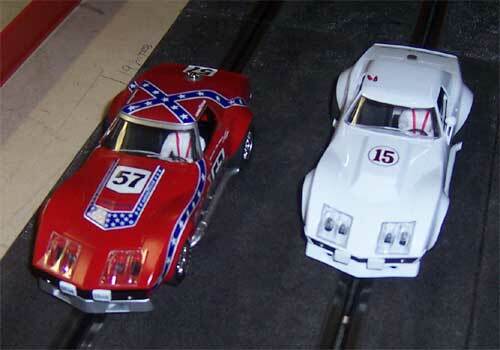 Jamie and Bo's flying Scalextric Vettes. Charlie has left the building. I only just caught Charlie flying through the air. 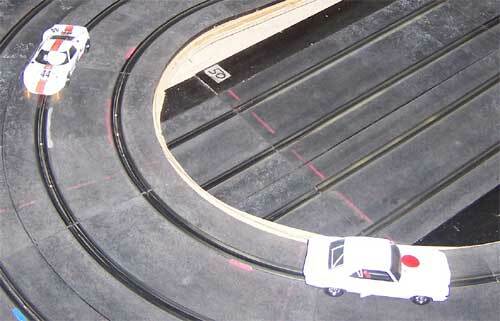 His SCX Mercedes was Slotit powered and when it got traction in a straight line there was no way of pulling it up except into the crash barrier at the end of the straight. Although Bump didn't show he was there in spirit courtesy of his latest classic Vee Dub he was building . Poor old Glenn was showing junior Bump how to throw a baseball but forgot to let go. Result was no use of the trigger hand. Hope he is OK for the next one. 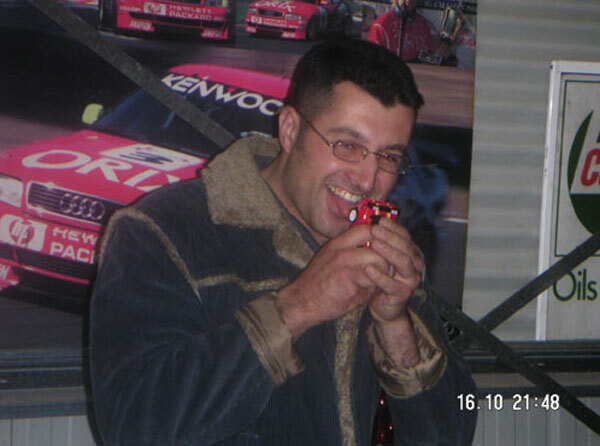 Some nice pics again Vinno. Keep up the good work and congratulations on your 500th post. Hip Hip Hooray!! Vinno, you could always post that pic of Jamie's tyre cleaning process to bring up post #501. At least that's what Devious thought he was doing with that car. 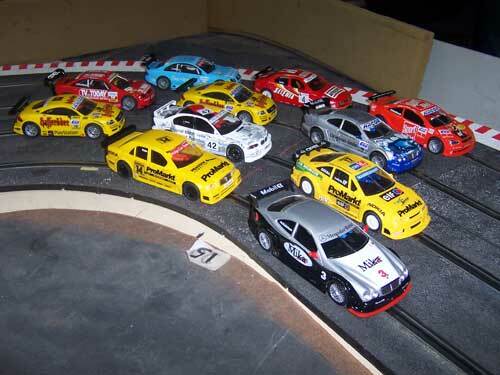 Great pics Vince and a very good racing night yet again.Here is a pic of Jamies tyre treament before each race. Dave did take a pic of Jamie doing that but I have not spotted it yet. If he sends it to me I will post it. Gene Simmons from Kiss would be envious. I was too slow obviously. Great pictures Vince it just goes to show all power but no brakes a lethal combo. Next time I will include either the optional anchor or Para shoot to pull my suckers up at the end of that straight. Either that or I wait till I am on the inside lane and just clear up the entire field on the first lap as I take that first corner. I'm working on Chicken, Salt and Vinegar and Original. Way to go Jamie !!! Jacob, thanks for showing us Jamie's true colours !! !